After shying away from Android, Microsoft recently accepted its defeat in the mobile OS arena and has since then has been earnestly working on making its Android apps better. Microsoft Launcher, which is among the company’s prime products for Android, is frequently updated and with this update, Cortana is finally coming out of her closet. With the latest update, Cortana support has been added to Microsoft Launcher and users will not have to rely on a standalone Cortana app to fiddle with the smart assistant. Microsoft has also added other new features related to the automatic wallpaper, the People cards, and other home screen controls. But, let’s first talk about the capabilities of Cortana that you can use with the Microsoft Launcher. Microsoft Launcher will guide new users through the ways Cortana can serve them through tips and suggestions. Second, there are several ways to invoke Cortana including a direct tap on the Feed Cortana card, dedicated Cortana shortcut, or nudging the search bar. Users can also manually set triggers for Cortana like double-tapping on the home screen or long-pressing the home button. 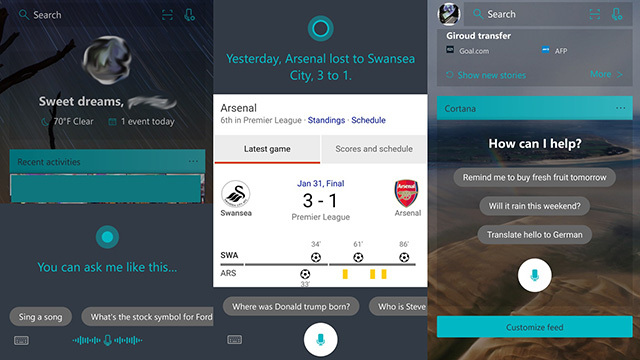 Cortana on Microsoft Launcher can be useful in a variety of ways such as launching apps, performing voice searches, taking calls, or reading and responding to SMSes. It can also be used to transfer media from the smartphone to a Windows 10 PC as well as to sync To-Do list and calendar entries with the PC. The assistant is also capable of curing your boredom by reading out news to you or chatting with you. Lastly, users will be able to control system settings with voice or text commands. Apart from Cortana’s additions, users can set Daily Bing wallpapers to either home screen or lock screen or both. Now, users can also keep widgets in the dock and pin favorite contacts to the home screen. While the addition of the virtual assistant appears like a step to bring seamless experience for Windows users, it could also be a slender move to one-up against Google Assistant. Meanwhile, if you want to give the new features a try, you can download Microsoft Launcher for Android from the Google Play Store for free.